I'm going to go out on a limb here and say that there is something about a godawful ugly shoe, that, like a truly unlovely pooch, is all the more charming for its flinch factor. There are lots of contenders out there (shoes, I mean)--many with a "functional" element that gurneys the shoe into the ICU of eyesores, apparel division. Below, a contemporary example: slippers, sadly no longer available for sale, that in their heyday performed the handy dual role of a) keeping your feet warm; b) dusting the floor as you shamble from fridge to sofa. This is how the shoes look fresh out of the box. 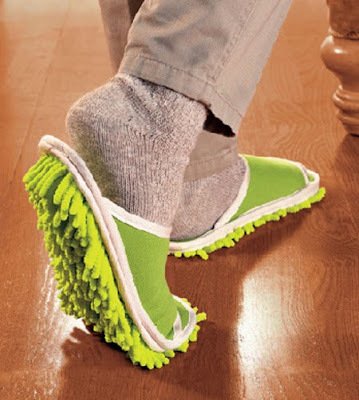 Imagine these bad boys with a few dust bunnies swept in and you can begin to appreciate their full repellence. Next up, an old favorite that ought to appeal to the mendicant guru in all of us: vintage Birks with little rubber fingers atop the footbed, offering what amounts to a Reiki treatment on the go. Truth be told, I would love to have a pair of these, but I've done worse in the ugly footwear department (see entry above) and can't countenance more than one pair like this in the closet (plus they're the wrong size). To be continued, tomorrow . . .
See fugly slippers and much more at the brilliant site Toxel, which scours the globe in search of inspired design of all kinds. 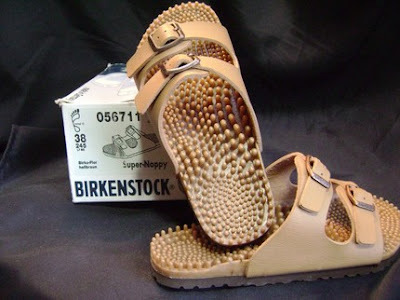 Many thanks to Etsy seller JunqueGypsy for the photo of the vintage Super-Noppy Birks.